I really don’t have much time, it’s too bad. I will need to reorganise things so that I have a little more time for anything else which isn’t work. Well, here is a leftover bento with not much new in it. 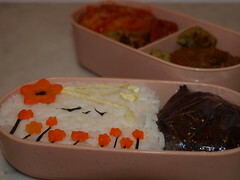 Except maybe that it is the first that I show this bento. I’m not really fond of it, to say true, it leeks, it’s not even airtight and I don’t really manage to play much with it. It looked pretty on the net, and once more I listened to the mermaids’ consumer song. I’m not really proud of myself. 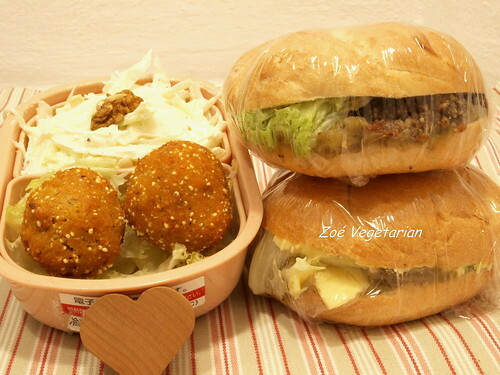 -Sandwich 2: aubergine caviar, seitan breaded with okara and miso spices, lettuce. As usual, I’m in a hurry, trying to get everything done and still to eat properly so I went for sandwiches today. 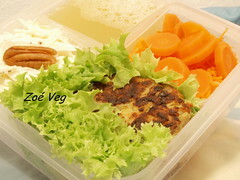 I saw on a few forums that people don’t imagine sandwiches to be vegetarian. (The box is my little Totoro box which got damaged during my last trip. 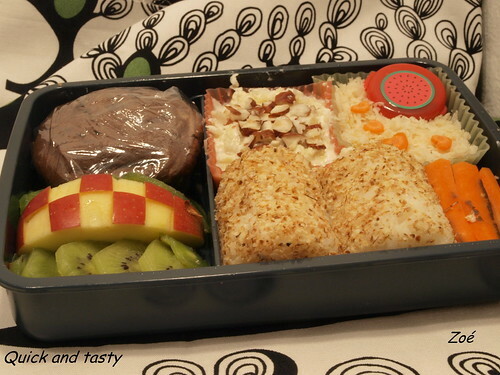 It’s last time, before ending in the museum of broken bento boxes…I hate these low cost flights!). Oh, I’m so sad, we finished our beetroot cupcakes! I had to prepare new cupcakes. These are easy yoghurt cupcakes flavoured with banana and chocolate. The other new item in this bento is the spicy tomato cabbage. 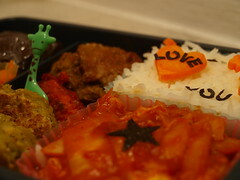 And guess what, I managed to forget my bento at home! 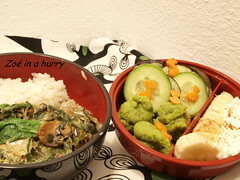 I had to go back and eat at home. Grr…There’s no use to prepare a bento if you forget it! I’m so scatterbrain. This time you can have a view of the two bentos. 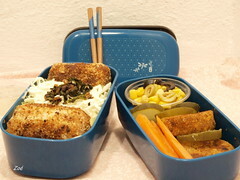 Bisounours_51 decorated mine (two tier bento) and me his (blue bento). Okay, I have to admit…he’s so more creative! Under the lens purée are hidden some vegetable dumplings. I love these smooth and crunchy taste at the same time!